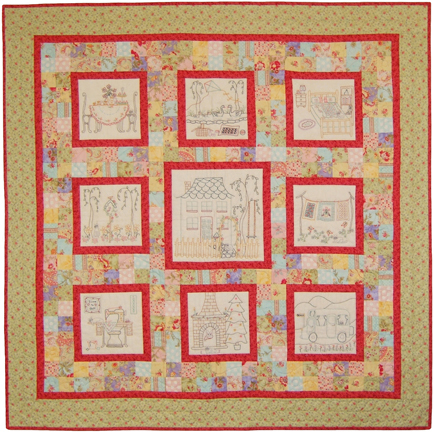 Quilt measures 56" x 56"
A beautiful stitchery quilt that takes you on a journey of all the things we love, from sewing, to holidays, to tea parties and much more. Made using simple backstitch embroidery and wonderful fabrics that’s truly a delight. This quilt is suitable for use with a Jelly roll. This pattern includes full sized patterns and is a great project to start building your embroidery and quilting skills, as it is suitable for all skill levels.